The law degree is for the office wall and this attractive resin ornament is for the tree! 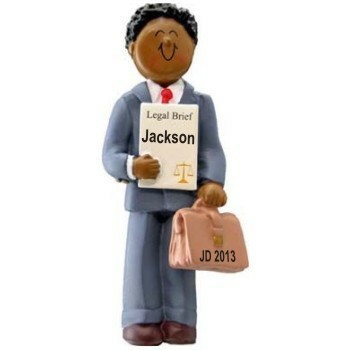 The African American male law school graduation personalized ornament celebrates a wonderful accomplishment while looking ahead to an exciting career. We'll custom letter his name and the year to make this a memento that will bring a smile to his face each holiday season. Our selection of African American ornaments for graduates includes those for medical school, culinary school, business school and many more, so you'll find just the right ones to honor the accomplishments of friends and family members. Spur him on to pass the bar and keep on going with the African American man law school graduate ornament that arrives in its own velvet drawstring pouch from Russell Rhodes.